For his biographies of Robert Moses and Lyndon Johnson, Robert A. Caro has twice won the Pulitzer Prize for Biography, twice won the National Book Critics Circle Award for Best Nonfiction Book of the Year, and has also won virtually every other major literary honor, including the National Book Award, the Gold Medal in Biography from the American Academy of Arts and Letters, and the Francis Parkman Prize, awarded by the Society of American Historians to the book that best "exemplifies the union of the historian and the artist." To create his first book, The Power Broker: Robert Moses and the Fall of New York, Caro spent seven years tracing and talking with hundreds of men and women who worked with, for, or against Robert Moses, including a score of his top aides. He examined mountains of files never open to the public. Everywhere acclaimed as a modern classic, The Power Broker was chosen by the Modern Library as one of the hundred greatest non-fiction books of the twentieth century. It is, according to David Halberstam, "Surely the greatest book ever written about a city." And The New York times Book Review said: "In the future, the scholar who writes the history of American cities in the twentieth century will doubtless begin with this extraordinary effort." To research The Years of Lyndon Johnson, Caro and his wife, Ina, moved from his native New York City to the Texas Hill Country and then to Washington, D.C., to live in the locales in which Johnson grew up and in which he built, while he was still young, his first political machine. He has spent years examining documents at the Johnson Library in Austin and interviewing men and women connected with Johnson's life, many of whom had never before been interviewed. 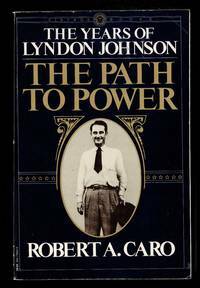 The first volume of The Years of Lyndon Johnson, The Path to Power, was cited by The Washington Post as "proof that we live in a great age of biography... [a book] of radiant excellence... Caro's evocation of the Texas Hill Country, his elaboration of Johnson's unsleeping ambition, his understanding of how politics actually work, are—let it be said flat out—at the summit of American historical writing." Professor Henry F. Graff of Columbia University called the second volume, Means of Ascent, "brilliant. No review does justice to the drama of the story Caro is telling, which is nothing less than how present-day politics was born." And the London Times hailed volume three, Masters of the Senate, as "a masterpiece... Robert Caro has written on of the truly great political biographies of the modern age." "Caro has a unique place among American political biographers," according to The Boston Globe. "He has become, in many ways, the standard by which his fellows are measured." And Nicholas von Hoffman wrote: "Caro has changed the art of political biography." New York: Alfred A. Knopf, 1982-2012. First editions of each volume in the historian's ground-breaking biography on President Lyndon Johnson. Octavo, 4 volumes, original cloth. Each volume is signed by Robert Caro and each are near fine to fine in near fine to fine dust jackets. A very sharp set. "A monumental political saga . . . powerful and stirring. It's an overwhelming experience to read The Path to Power" (The New York Times). "Stands at the pinnacle of the biographical art" (Donald R. Morris, Houston Post). New York: Knopf, 1982. First. hardcover. fine/very good(+). Illustrated in black and white. 882 pages, thick 8vo, black cloth, edgeworn dust wrapper. New York: Knopf, 1982. First edition. A fine copy in a very good(+) dust wrapper. Inscribed on the front free endpaper to the philanthropists Edith and Martin Segal: "For Marty and Edith, from Robert A. Caro. London: Bodley Head, 1990. hardcover. near fine/very good. Illustrated with black-and-white photographs. 506 pages, thick 8vo, black cloth, dust wrapper (slightly edge-worn with two small closed tears). London: The Bodley Head, (1990). A near fine copy in a very good dust wrapper. Inscribed to the philanthropists Edith and Martin Segal on the front free endpaper: "For Martin and Edith from Robert A. Caro. Alfred A. Knopf, 11/12/1982. Hardcover. Very Good. Signed. **Signed by Robert A. Caro** Hardcover and dust jacket. Good binding and cover. Previous owners inscription. Clean, unmarked pages. Ships daily. Knopf, 2013-04-09. Hardcover. Like New. 4 volume set. Published 1982-2013. Hardcover and dust jacket. Good bindings and covers. Shelf wear. Clean, unmarked pages. The Path to Power reveals the genesis of the almost superhuman drive, energy, and urge to power that set LBJ apart. Chronicling the startling early emergence of JohnsonÃ¢â¬â¢s political genius, it follows him from his Texas boyhood through the years of the Depression in the Texas Hill Country to the triumph of his congressional debut in New Deal Washington, to his heartbreaking defeat in his first race for the Senate, and his attainment, nonetheless of the national power for which he hungered.National Book Critics Circle Award in Nonfiction Means of Ascent follows Johnson through his service in World War II to the foundation of his long-concealed fortune and the facts behind the myth he created about it. The explosive heart of the book is CaroÃ¢â¬â¢s revelation of the true story of the fiercely contested 1948 senatorial election, which Johnson had to win or face certain political death, and which he did win--by Ã¢â¬Å87 votes that changed history.Ã¢â¬Â Caro makes us witness to a momentous turning point in American politics; the tragic last stand of the old politics versus the newÃ¢â¬âthe politics of issue versus the politics of image, mass manipulation, money and electronic dazzle.National Book Critics Circle Award in Biography Master of the Senate carries JohnsonÃ¢â¬â¢s story through his twelve remarkable years in the Senate. It is an unprecedented revelation of how legislative power works in America, how the Senate works, and how Johnson, in his ascent to the presidency, mastered the Senate as no political leader before him had ever done. In a breathtaking tour de force, Caro details JohnsonÃ¢â¬â¢s amazing triumph in maneuvering to passage the first civil rights legislation since 1875.Pulitzer Prize in BiographyLos Angeles Times Book Award in BiographyNational Book Award in Nonfiction The Passage of Power is an unparalleled account of the battle between Johnson and John Kennedy for the 1960 presidential nomination, of the machinations behind KennedyÃ¢â¬â¢s decision to offer Johnson the vice presidency, of JohnsonÃ¢â¬â¢s powerlessness and humiliation in that role, and of the savage animosity between Johnson and Robert Kennedy. In CaroÃ¢â¬â¢s description of the Kennedy assassination, which The New York Times called Ã¢â¬Åthe most riveting ever,Ã¢â¬Â we see the events of November 22, 1963, for the first time through Lyndon JohnsonÃ¢â¬â¢s eyes. And we watch as his political genius enables him to grasp the reins of the presidency with total command and, within weeks, make it wholly his own, surmounting unprecedented obstacles in order to fulfill the highest purpose of the office.National Book Critics Circle Award in Biography <br> This is an oversized or heavy book, that requires additional postage for international delivery outside the US. New York: Alfred A. Knopf, 2012. Book. As New. Hardcover. 1st Edition. First Edition/First Printing. Hardcover in dustjacket. Huge at 712 pages with photographs. Book Four of Robert A. Caro's monumental work. One of the great political biographies of the modern age. Just a touch of edgewear to the top of the dustjacket spine, otherwise: As new. Unread. From my smoke-free collection. Ships in well-padded box..
New York: Alfred A. Knopf, 2002. WYSIWYG pricing--no added shipping charge for standard shipping within USA. Black cloth, gilt titles on front board & spine, pictorial endpapers, xxiv, 1167,  pp, 16 ff b & w photo plates, notes, bibliography, index. DJ in Brodart archival cover. Third volume in Caro's massive biography of LBJ. Caro is a biographer whose books are as hard to put down as they are to pick up. Shipping weight 5 lbs.. First Edition. . Fine/Fine. 24 X 16 cm. Alfred A. Knopf, 1982 Excellent condition! Like new Book and DJ except for dedication on flyleaf. As nice a copy as you will see.. Hard Cover. Fine/As New. 4to - over 9¾" - 12" tall. New York: Alfred A. Knopf, 2012. 1st. Hardcover. Near fine/near fine. Bound in publisher's original black cloth over boards, spine and cover stamped in gilt. Dust jacket lightly rubbed at the extremities. New York, New York: Alfred A. Knopf, 2002. DJ with very slight wrinkle at upper edge of rear panel, otherwise book and DJ Fine. DJ in plastic cover. Caro's third book in his Lyndon Baines Johnson biography. Winner of the 2003 Pulitzer Prize for Biography and the 2002 National Book Award for Nonfiction. Illus. with B&W photos. Incl. Debts, Sources, Notes and Index. (xxiv) 1167 pp. Heavy book.. First Edition, 1st Printing. Hard Cover. Fine/Fine. NY. Alfred A. Knopf. 2012. HARDCOVER.. Near Fine/Fine dj. (multiple tiny & faint splotches on covers else appears never read. no writings. Jacket like new, no tears) 8vo. 32 pages of glossy photographs in black & white. Gilt stamped navy cloth covers, gray endpapers. Deckle edge. Not a remainder or book club. Source Notes & Index. A true first edition. $35.00 jacket price. First Edition so stated & per title page date. No Print Line. (True modern Knopf first editions have publication date on title page.) Beware faux copyright page stated First Editions; they may have a print line beginning with 2. Alfred A. Knopf, 1982-11-12. Hardcover. Good. New York: Alfred A. Knopf, 1990. A clean, unmarked and unclipped copy in a Brodart jacket cover.. First Edition. Cloth. Fine/Fine. Illus. by Photographs. Octavo. Vintage Books, 1991-01-01. Paperback. Good. Paperbacks. 4 BOOK SET. Pages are clean and unmarked. Covers show edge wear. Books have minor corner bumps. Light creases on spine on "the means..." and "the path...". TITLES: The Path to Power (1983), Means of Ascent (1990), Master of the Senate (2002), and The Passage of Power (2012). ; 100% Satisfaction Guaranteed! Ships same or next business day! New York: Alfred A. Knopf, 1990. WYSIWYG pricing--no added shipping charge for standard shipping within USA. Sewn in full black cloth, gilt titles on front board & spine, pale grey endpapers, xxxiv, 506,  pp, map, 16 ff b & w photo plates, bibliography, notes, index. Signature of psychologist David Lykken on recto of ffep, bottom edge slightly rubbed and endpapers fading at edges, two plates marred at gutter by excess binding glue. DJ in Brodart archival cover. The second volume in Caro's massive biography of President Lyndon Johnson. Caro uses documents, published sources, oral histories, and interviews, combining careful research with a highly engaging style of writing. Shipping weight 4 lbs. (International 3 lbs., 4 oz.). First Edition. . Near Fine/Fine. 24 X 16½ cm. New York: Alfred A. Knopf, 1982. WYSIWYG pricing--no added shipping charge for standard shipping within USA. Black cloth, author's name stamped in gold on front board, xxiii, 882 pp, 24 ff photo plates not in pagination, bibliography, notes, index. Slight edge wear, previous owner's name on a preliminary. Price-clipped DJ in Brodart archival cover. Volume one of Caro's massive biography of President Lyndon Johnson investigates the origins of Johnson's great competitive drive, and carries the story to his defeat in a special Senate election in 1941, with a few words about later times. Shipping weight 4 lbs.. 2nd ptg. . Near Fine/Near Fine. 24 X 16½ cm. New York: Alfred A. Knopf, 1982. Fine. Book club edition. Volume one only. 882pp. Glossy wrappers. Illustrated. Fine. New York: Alfred A. Knopf, 2002. 2002, 1167pp, illus., illus. eps, black cloth, slight rubbing to cover, slight edgewear to dj, contents clean.. First Edition. Cloth. Very Good -/Very Good -. Alfred A. Knopf, 1982-11-12. 1st. Hardcover. Very Good. Alfred A. Knopf, 1982-11-12. Hardcover. Good. 1982 used hardcover copy with worn out dust jacket. Pages clean and intact. Alfred A Knopf, 1990. C 1990 Good with DJ and 1st Edition. First Edition. Hard Cover. Good/Good. NY. Alfred A. Knopf. 1990. HARDCOVER.. Near Fine/Fine dj. (top outer edge dust spotted/foxed, front e.p. partly, faintly discolored by newpaper clipping. jacket complete/clean/crisp, no tears) 8vo. Book Two in the series. 32 pages of glossy photographs & a map. xxxiv. + 510pp. Includes Source Notes, Bibliography, & Index. Not a Remainder or Book Club. Borzoi colophon. 3/90 on back jacket flap. First Edition so stated & per title page date. Deckle edge. Gilt lettered, full black cloth covers, gray endpapers. $24.95 jacket price. The Years of Lyndon Johnson: The Means of Ascent. NY: Knopf, 1990. First printing, near fine in a near fine dust jacket. The pasge block is just very lightly soiled; and the jacket has minor edgewear. The second volume of Caro's biography of LBJ. Includes some photographs, bibliography, endnotes, and an index; 506 pages.. First Edition. Hard Cover. New York: Alfred A. Knopf. Fine copy in fine dust jacket. 1990. 1st. hardcover. 8vo, 506 pp. .
Vancouver, Washington, U.S.A.: Vintage Books, 1991. Wraps have light wear. Pages are clean & text is free from markings. All pages secure in binding.. Soft Cover. Good. 8vo - 7¾" - 9¾" Tall. Vintage, 1983-10-12. Paperback. Like New. New York: Harper & Brothers, Publishers, 1974. Black cloth boards are scuffed, with spinecover sunned, gummark on front. Pages are clean, text has no markings, binding is sound. . Fifth Printing. Hard Cover. Good/No Jacket. 8vo - over 7¾" - 9¾" tall. Cincinnati OH: South-Western Publishing Co., 1961. Boards are scuffed, aging and rubbed on edges, corners and tips, gummark on front. Pages are clean, text has no markings, binding is sound. . Third Edition. Hard Cover. Good +/No Jacket. 8vo - over 7¾" - 9¾" tall. Vancouver, Washington, U.S.A.: Vintage Books, 1983. First Edition 1st Printing. Trade Paperback. Good +. 8vo - over 7¾" - 9¾" tall. Stated: First Vintage Books Edition November, 1983. Minor Wear With A Crease To The Lower Back Corner.